If one of your crew goes overboard, RescueME MOB1 improves their chance of rescue, combining AIS, an integrated GPS for pinpoint accuracy, and the DSC system of your VHF radio. 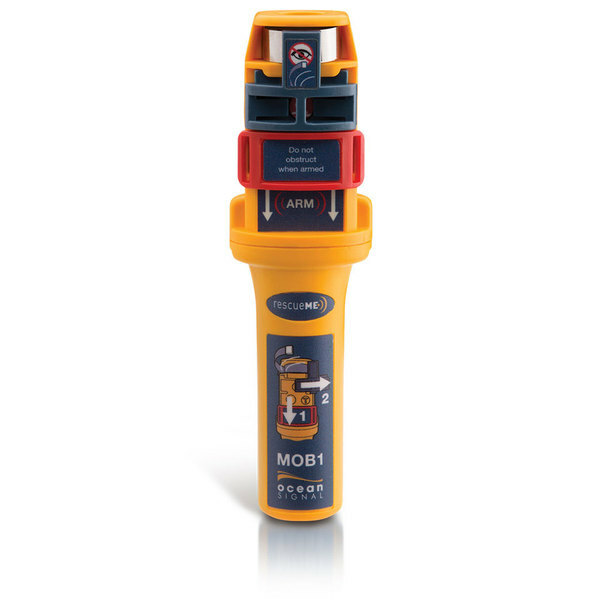 MOB1 is a new type of Personal Locator Beacon, using both the AIS system and VHF radios with modern Digital Selective Calling. Attach it to the oral inflation tube of your inflatable life jacket, and if you fall overboard, it will automatically activate when the life jacket inflates (and can also be activated manually). Get rescued by your own boat: If you fall overboard, your best chance of being rescued comes from your own boat, but for this to happen, your crew needs to be immediately aware of the incident and keep track of your position while the recovery is being carried out. Yet even in moderate seas, it is alarming how fast your crew can lose sight of a person in the water. In an emergency, rescueME MOB1 provides two methods of rapidly communicating your position, accurate to a few meters, and also provides a visual ID with its high intensity white LED strobe light. MOB Alert sent to AIS-equipped vessels: Once activated, your MOB1 will transmit an MOB Status alert, and send Position Alerts eight times per minute to all AIS enabled vessels in the vicinity. The integrated GPS ensures precise location is sent to your vessel and any others that may be assisting. DSC Call: An additional feature of the MOB1, is its ability to activate the DSC alarm on your vessels VHF, alerting your crew to the situation. Will produce closed loop calls if programmed in the US. This means it will call a single MMSI number every five minutes and one programmed Group call at 30 minutes activation. Compatibility: Most modern AIS plotters and DSC VHF radios comply with the standards required to receive MOB transmissions. It is recommended that you check compatibility with the equipment manufacturer, especially if you are using older equipment. WARNING: This product can expose you to chemicals including Bisphenol A (BPA), which is known to the State of California to cause birth defects or other reproductive harm. For more information, go to www.P65Warnings.ca.gov.